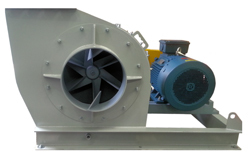 Aerovent Australia can design and manufacture radial type centrifugal fans to suit almost every materials handling application requiring the movement of product such as dirt, grain, paper, wood waste etc. Special attention is paid to the radial impeller design so that product cannot build-up preventing excessive vibration and the potential of fan failure. Materials handling fan construction are heavy duty and can incorporate replaceable wear surfaces for prolonged service life. Many design and material options are available to suit almost every materials handling application.